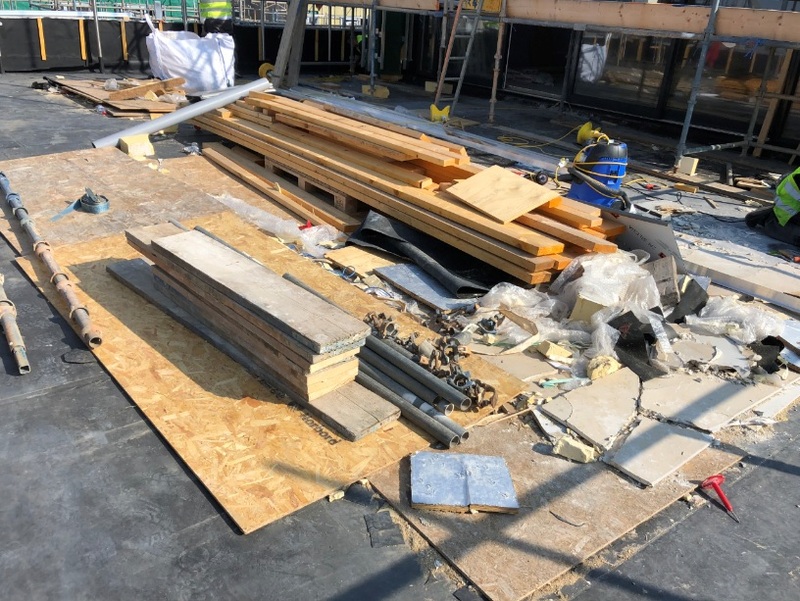 Brunton’s Blog – Newly completed roofs as storage and working platforms – It still happens! We’ve all seen it, reported on it, discussed it and written about it. Are some main contractors or following trades taking their responsibilities seriously? No matter how much evidence is generated to explain the risk of ruining the newly completed roof, it still happens? 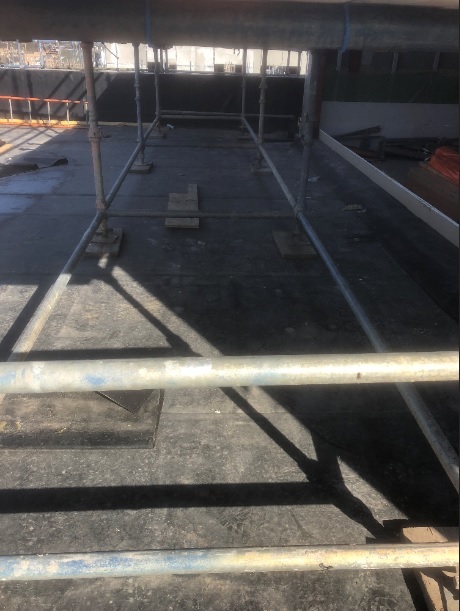 The roofing subcontractor will write to the main contractor by email with numerous pictures of the new roof being used as a storage platform or worse still as a working platform. Another scaffold has been erected from the finished work to access higher external levels. Yes, we have seen embedded scaffold poles in new roofs. 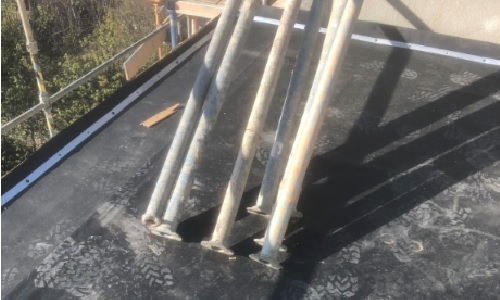 Often, it strangely happens when the roofer is offsite and goes unreported allowing water ingress into the system and a complaint made against the roofer who’s expected to attend immediately, as “your roof is leaking”. Reality is, for certain it’s not the roofing contractor’s roof. They are merely installing products and systems, correctly we expect, to a building that all should respect during construction, main contractor and other subcontractors alike. It is ultimately the client’s roof! If the roofer is lucky there may be some form of protection offered by laying plywood or OSB on the finished surface. But does that give adequate protection – try laying a large sheet of ply without any edges or corners hitting the membrane first, before the flat surface – it’s almost impossible. Often a poor quality sacrificial board is used with splintered edges increasing the risk of damage. Add wind and rain into the mix, because on our island both are frequent visitors, and the roofer’s nightmare compounds. Ironically, it’s often good to see the damage caused by a scaffold pole or timber splinter as this, at least, gives an indication of where the system has been breached, allowing a proper record to be taken, a repair made and sometimes, responsibility established. The roofer getting paid for the immediate attendance and repair is another matter that often gets lost in the fog of a contractual dispute. An even more concerning problem is the establishment of a “working platform” on a newly completed membrane roof. Metal being cut or grinded above the membrane whether protected or not can lead to a whole host of undetectable damage. Metal filings slipping between timber boarded protected areas gets walked on and embedded in the waterproofing. These issues can also be extremely difficult to detect sometime later. All flat roofing systems are prone to such damage. A nail, metal filing, scaffold pole or timber splinter can just about go through most waterproofing systems. It is surely bad practice to allow any finished roof to be used as a storage and/or working platform. In the fortunate case, the damage is found the main contractor may instruct a repair. However, it is often the case, depending on the type of damage and length of time to repair, that water has entered the system, leading to potential long-term roof issues. Simply repairing where the damage occurred does not address this. The roofer needs to be sure that water is not going to be trapped in the system which often requires more extensive investigation and remedial action. 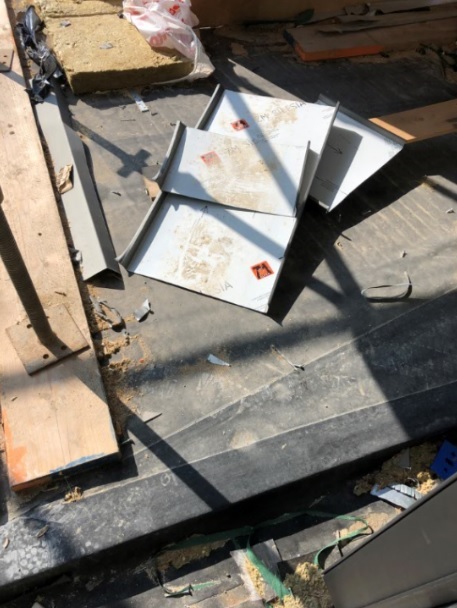 It is inevitable that some roofs will continue to be used as storage and/or working platforms and roofing product manufacturers and contractors within SPRA have extensive information on how to address the issue to ensure the risk of damage is minimised. The risk will always be there. Is it time to ensure that the issue is elevated further within the construction industry as it is also a cultural issue. Site and project managers must realise that this is a real problem of inadequate site management. Allowance must be made for the cost of protection at the outset. It cannot be some afterthought that there is not adequate bill provision finance to support. The approach taken could be that of “temporary works” clauses in the contract ensuring provision is made. The only issue with higher priority level should be personal worker/visitor site safety. Protection and the safety of finished work should be next in priority.